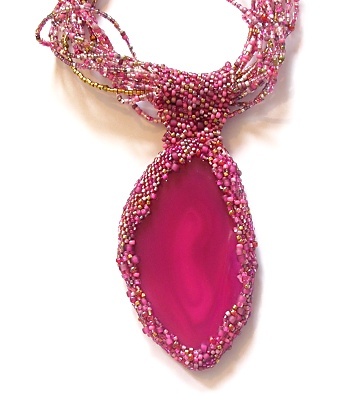 A bright pink slice of agate encased using peyote stitch then strung on a multi-strand necklace using the same beads that were used to encase the slice. I used a mix of beads; different shapes, sizes and colours to give the piece texture and interest. The slice is open to the front and back, with the beadwork just going around the edges. I beaded it this way as the slice is slightly different on each side and I wanted the ability to wear it with either side showing. Once the slice was captured, I beaded a ‘bail’ through which the strands of the necklace could thread. The necklace is long enough that it can be twisted before fastening to alter the wearing length.